Puri or poori is a famous Indian fried bread which is loved by almost all generations. Its a great full-filing meal. Puri's are made out of wheat flour dough, flattened into small pancake shape and then fried in hot oil. It gets fluffy when dropped in hot oil and I love to have it super hot and fluffed till it gets into my plate. 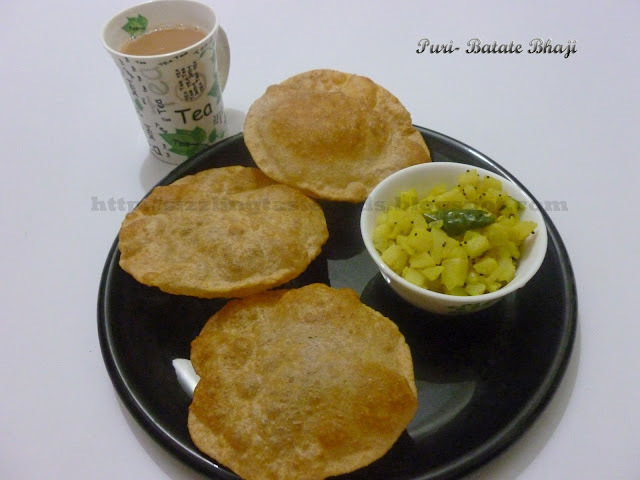 Always tempted to have puri's at restaurants but I prefer satisfying myself and my family with hot hot puri's at home direct from my kitchen for the breakfast. My husband loves puri's with kheer especially Savige payasa(vermicelli kheer) or Channa Dal Kheer. 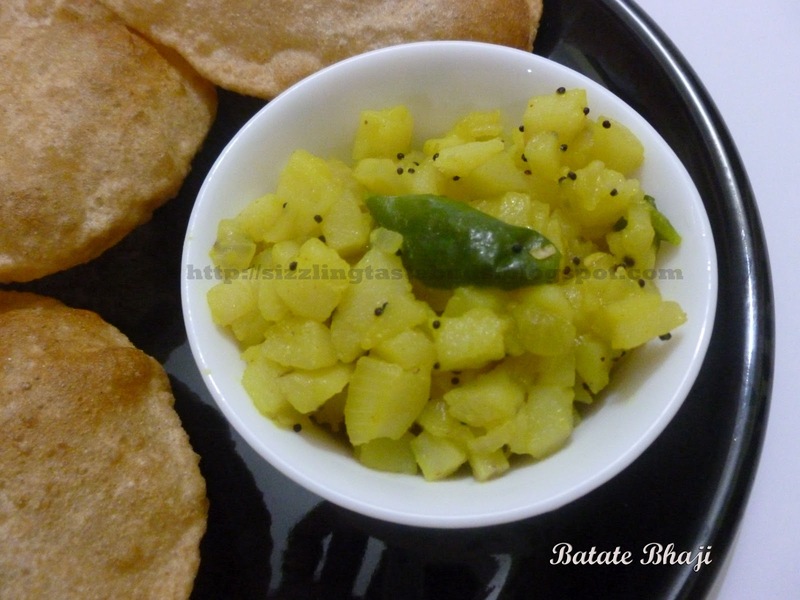 I too like it that way but given a chance its always Puri's with simple Batate( Potato) bhaji. 1. Make a dough of the above ingredients except oil. The dough should be slightly harder than the chapati dough. Adding more water will result in puri's absorbing more oil. 2. Make small balls out of it and flatten a small batch into small discs dusting it with some more wheat flour and rolling it with a rolling pin. 3. Drop one flatten puri's into a medium hot oil and fry till you get a nice crisp layer on the puri's. The puri's get fluffed when dropped in hot oil. Take care while trying to turn the fluffed puri's to fry on other end as it should not get poked else oil enters in. 4. Remove it from oil and and place it on a kitchen towel to absorb any excess oil. 5. Hot Hot Puri's are ready to be served. 1. Peel the potatoes and cut into small pieces. Wash it. 2. Heat 2 tsp oil in a kadai and add mustard seeds. Let it crackle. 3. Add chopped or sliced onions and fry till they turn translucent. 4. Add chopped potatoes and slit green chillies. Pour enough water and cook it by covering it with a lid. 5. Once the potatoes are have cooked add salt to taste and cook further till potatoes are totally cooked and the water evaporates completely. Serve it with Hot Puri's.